Bobby Jindal, Republican governor of Louisiana, called a recent Department of Justice (DOJ) lawsuit to block Louisiana’s school-voucher system "cynical, immoral and hypocritical" at a National Press Club Newsmaker Sept. 18. The lawsuit would block the program, which provides vouchers that parents can use to pay for schools of their choice in Louisiana parishes that operate under federal desegregation orders. The governor termed the suit cynical because it would use desegregation laws designed to protect minority children to trap those children in failing schools. Ninety percent of the children in the voucher program are minorities, mostly low income, Jindal said. The suit is immoral because children only grow up once and it is immoral to tell them to wait for gradual improvement in schools, Jindal said. Jindal found the suit hypocritical because Attorney General Eric Holder and President Barack Obama have the means to send their own children to schools they choose while the administration's lawsuit would prevent low-income Louisiana parents from having the same privilege. Former Gov. Jeb Bush, R-Fla., joined Jindal on the program and said voucher programs improve all schools through competition. Sen. Tim Scott, R-SC, agreed with his fellow panelists. "When parents have a choice, kids have a chance," he said. The panelists noted the importance of good education systems to attract employers to states. Scott cited his experience recruiting companies to South Carolina, saying the question he always heard was "How is your education system?" The panelists agreed that the political impetus for the lawsuit was "government unions." Jindal cited and opposed a teacher’s union representative in Louisiana who said poor parents didn’t know what their children need. Jindal named media whose editorials have opposed the lawsuit: The Wall Street Journal, National Review, The Weekly Standard, The Washington Post and Chicago Tribune. The panelists advocated that the DOJ drop its lawsuit. 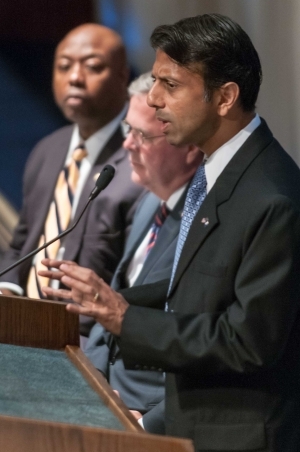 Jindal cited the New Orleans school system as an example of the effects of voucher programs. Ninety percent of the students in New Orleans are in charter schools, he said. "In five years, they have doubled the percentage of kids at grade level in reading and math," he said. The program was introduced following Hurricane Katrina when, according to Jindal, New Orleans had one of the worst school systems in the country. Jindal said the next step would be a court hearing in early November. Bush added that families affected by the DOJ ruling would also have legal representation in the case. Bush and Jindal said school reform is an example of positive and innovative programs Republicans are implementing at the state level, which they contrasted with the gridlock in Washington. Bush went further, in response to a question, by addressing healthcare, saying "Republicans need to have a clear, understandable alternative." The Republican Party needs to do more than attempt to repeal and defund Obama’s program; the party needs to replace it as well, he said.